We coddle your pets when you cannot! For us every day is love your pet day. 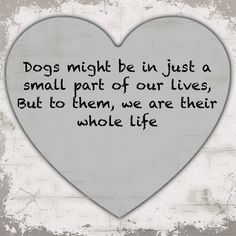 We love our three dogs to the moon and back. And what a joy it is to take care of so many other well loved pets. Have you told your pet that you love her lately? 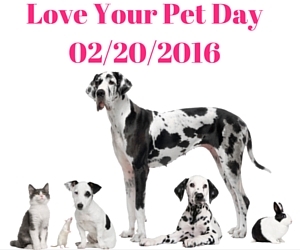 Check out our nine awesome was to demonstrate that you love your pet. Let your pet know how much you love his species by volunteering with a pet rescue group. You can transport rescued dogs or cats from a shelter to a foster home, be a foster parent, build a fence for a chained dog, rescue a bird, volunteer at a shelter to take photos of homeless pets or share about lost pets on social media. We bet you have lots more ideas. Share those ideas with us. Take your dogs on a hike. You can go on your own trail on your property, visit a state or national park or just take a stroll around your local park. Your dogs will thank you for the opportunity for a change of scenery and better yet a change of aromas. Luke shows Daisy Mae around our woods on her adoption day. Brush your dogs’ and cats’ teeth every day. Did you know that one way to show your pet that you love your pet is to assure they have teeth free of pain, plaque and tartar? Just like humans, dental health is important. Infection in the mouth can get in the bloodstream and lead to serious damage to major organs. Even more important, our dogs and cats can not tell us their teeth hurt and will probably try to hide their pain. 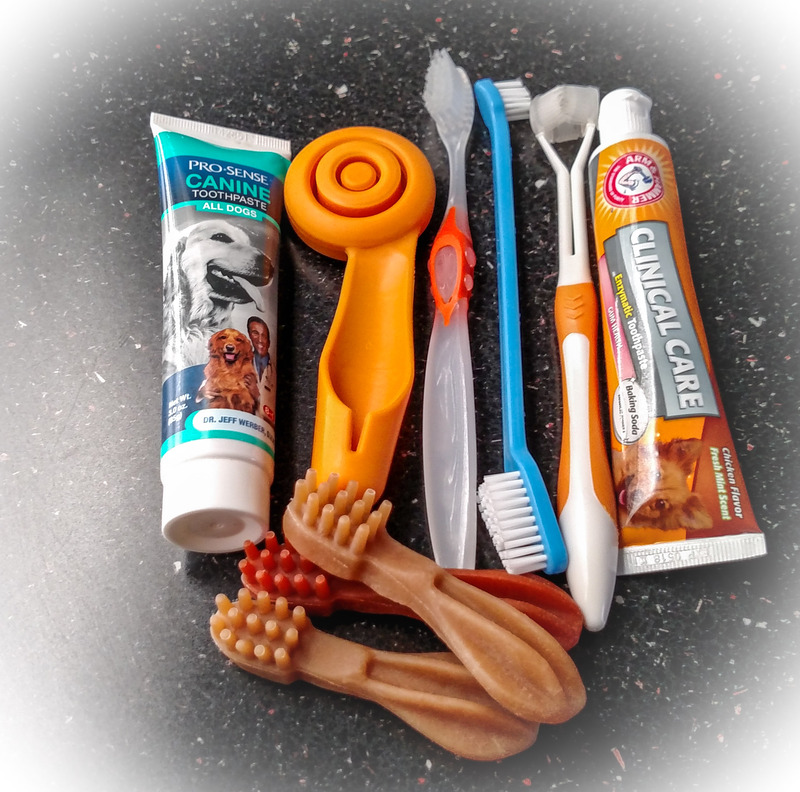 The link at the beginning of this bullet point provides a self test about your knowledge regarding dental health and gives step by step instructions to teach your cat or dog to accept having their teeth brushed. Our pet dental kit includes various styles of toothbrushes, toothpaste made for dogs and dental chews. Play with your cats. Contrary to popular belief cats do enjoy quality time with their humans. You can use flirt poles to get your cats to turn on their prey drives, spray catnip spray on tiny stuffed mice to get them to engage or drop a ping pong ball on the floor for them to bat around. And what cat does not like to play in a bathroom sink with the water faucet on? Tell us what kind of play your cat most likes. 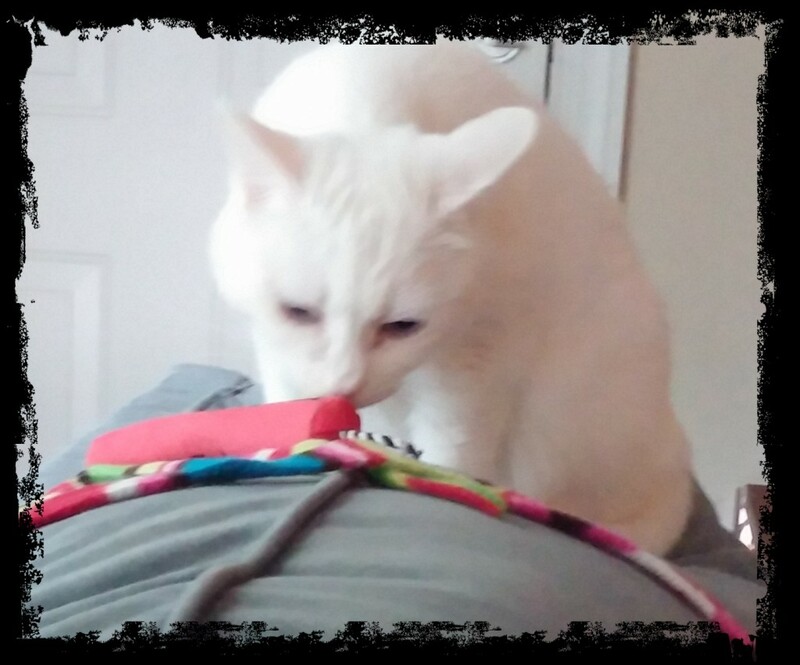 Nibbles loves to play if approached quietly and calmly. 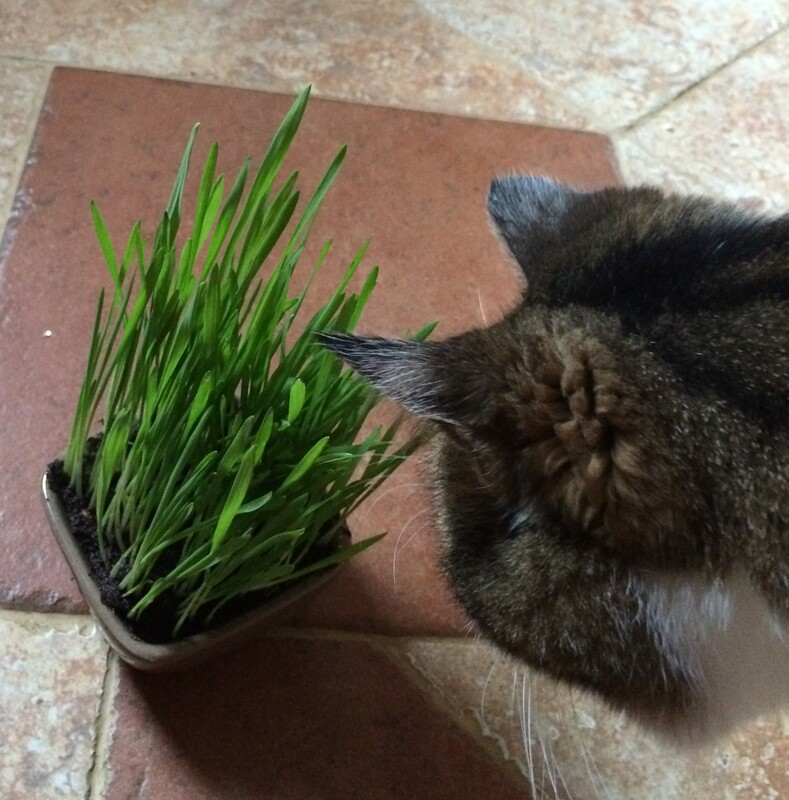 Plant a cat grass garden for your cats. This is particularly important for indoor only cats. 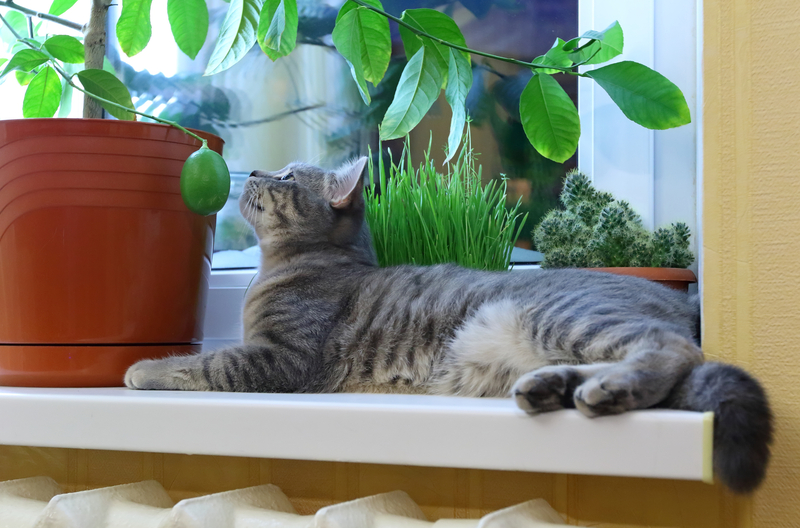 The grasses will stimulate their senses, give them something to nibble on, help to prevent hairballs, aid digestion and steer them away from potentially toxic house plants. Tootsie enjoys her kitty garden. Feed your pets the best quality food you can afford. Prices of kibble ranges from very low to very high. We know that you have to stay within your budget. Check out an objective resource to learn what your pet needs and what is in the food you are buying. 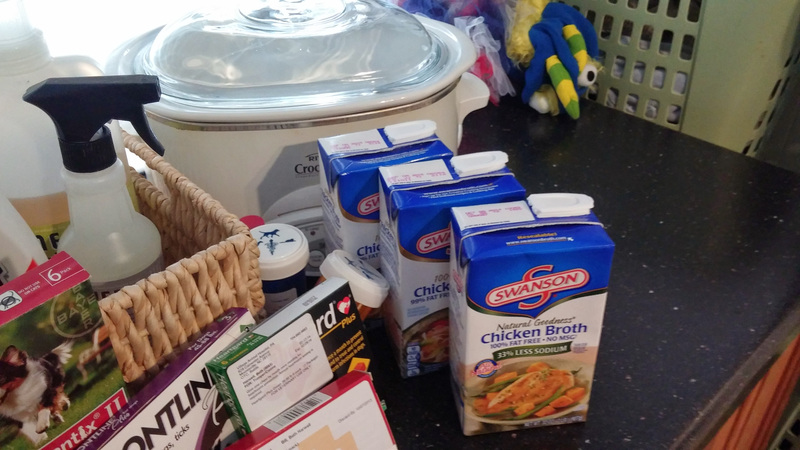 We recommend against buying your food at a big box retail store unless it specializes in pet supplies. 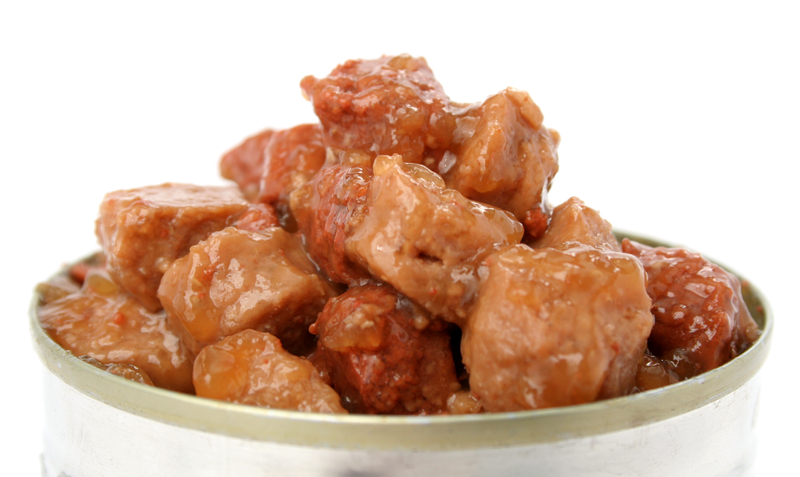 Two great local places to purchase pet food in the Lake Norman area are Village Paws and Claws in Mooresville and Huntersville and the Dog Supplies in Huntersville. You will find knowledgeable staff at these stores. You will not find low quality food and that’s important. Both stores offer discounts. Canned cat food provides necessary water content for your cats. Learn about ways to make your home feel safe, comfortable and inviting for your cat. Remember that cats love vertical spaces and don’t like to be backed into corners. That’s why cat trees, elevated shelves and tunnels, and sunny windowsills make them so happy. You can create “Cat TV” for them by placing a bird feeder outside a window they can easily see out of. Go a few steps further and put a cat grass garden in the enlarged windowsill or bay window. Add a scratching post nearby so your cat can keep his claws neatly trimmed and avoid shredding your furniture. Cat lounging in window sill. All he needs is a view of a bird feeder! 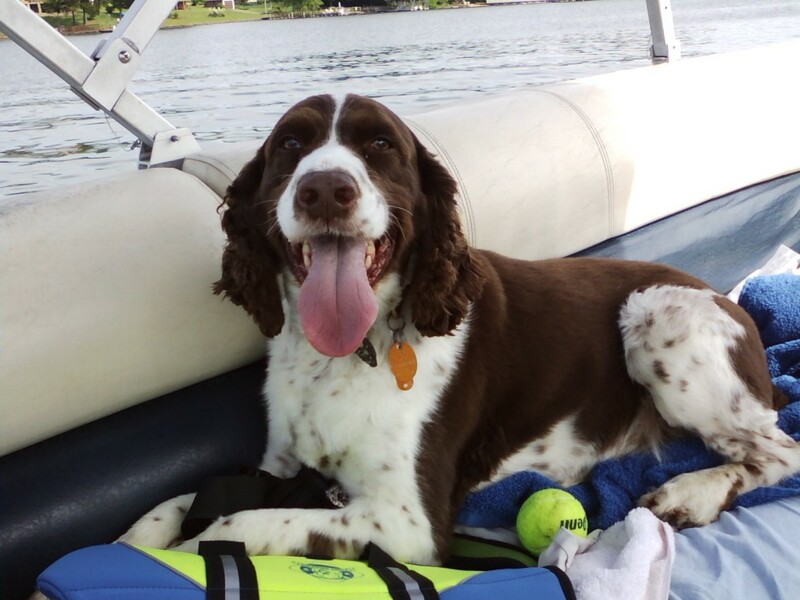 Take your dogs on a pet friendly vacation. There are scores of beach and mountain rentals that accept dogs. Our two favorite places to vacation with our dogs are Duck, NC on the NC Outer Banks and Hot Springs Log Cabins in the mountains of NC. Daisy Mae and Trooper in Duck, NC. Provide regular veterinary care for your pets. Getting them examined yearly while young and more often when they are seniors ensures that you catch little problems before they become big problems. Regular immunizations and preventives for fleas, ticks and heart worm are essential. Those dental cleanings can be lifesavers tool. No one wants their pet to be in pain. 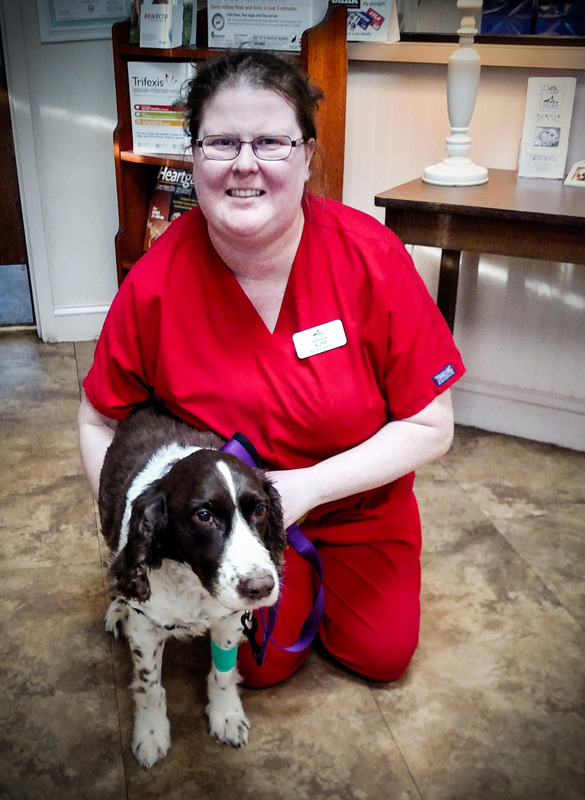 Our sweet senior Luke had his dental cleaning earlier this week. We had no idea that he had cracked a tooth and that infection had set in. Fortunately his tooth infection had not caused damage to his internal organs but sadly he did have to have a tooth extracted. I shudder to think what would have happened if we had not gotten a routine dental cleaning for him. Luke with Ms Kim at Village Animal Hospital in Mooresville. He was still a little glassy eyed after his extraction. We would be remiss if we didn’t recommend that you hire a professional pet sitter when you must leave your pets at home. 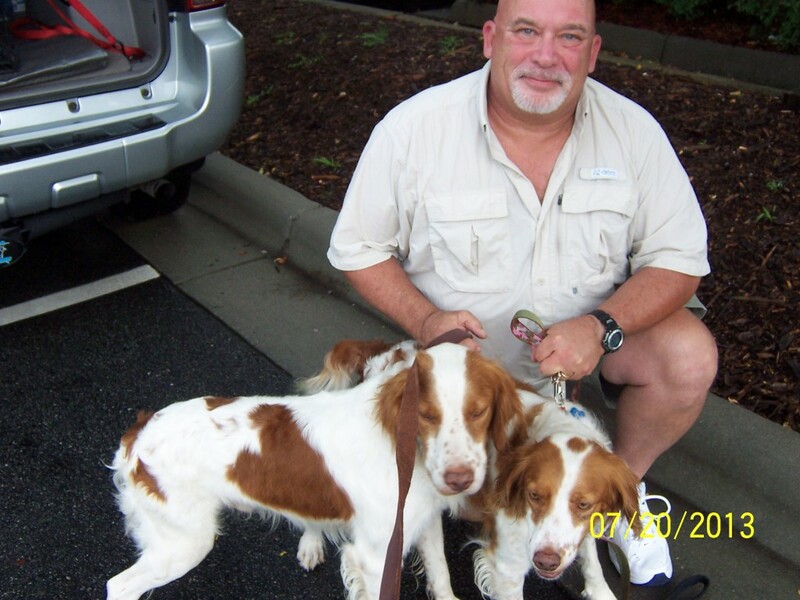 We provide daily dog walking services and vacation pet sitting services in the Mooresville, Cornelius, Davidson and Mount Ulla communities. Call us at 704-662-0973 to arrange a free meet and greet consultation. 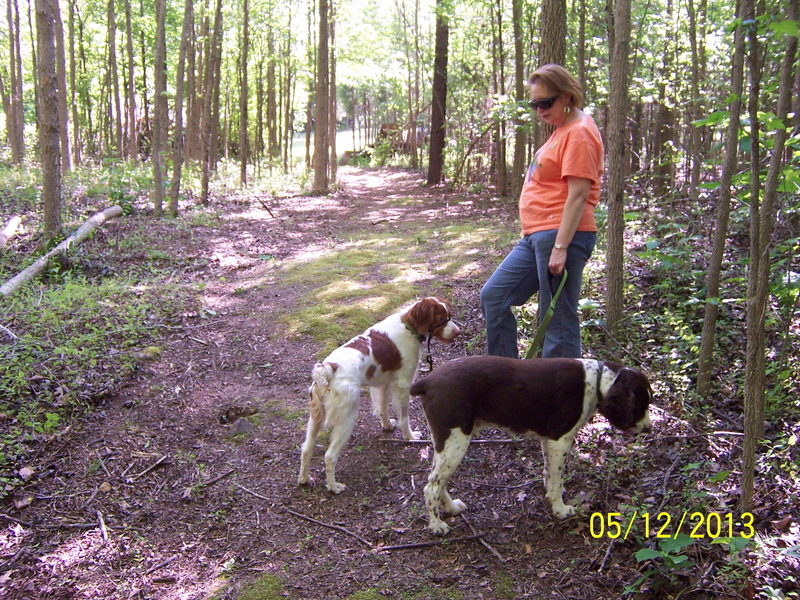 Do You Know Where to Find a Positive Reinforcement Dog Trainer? Do You Know 11 Steps to Responsible Pet Ownership? Have More Questions? Ready To Reserve? Call 704-662-0973 today! What Is a Professional Pet Sitter? We are celebrating professional pet sitters week March 1- 7. You may ask, “So, what is pet sitting anyway?” Dictionary.com defines pet sitting as “the act of caring for a pet in its own home while the owner is away.” What makes one a professional pet sitter? If you live in Mooresville, Davidson or Cornelius, how do you choose the best professional pet sitter for you and your pets? 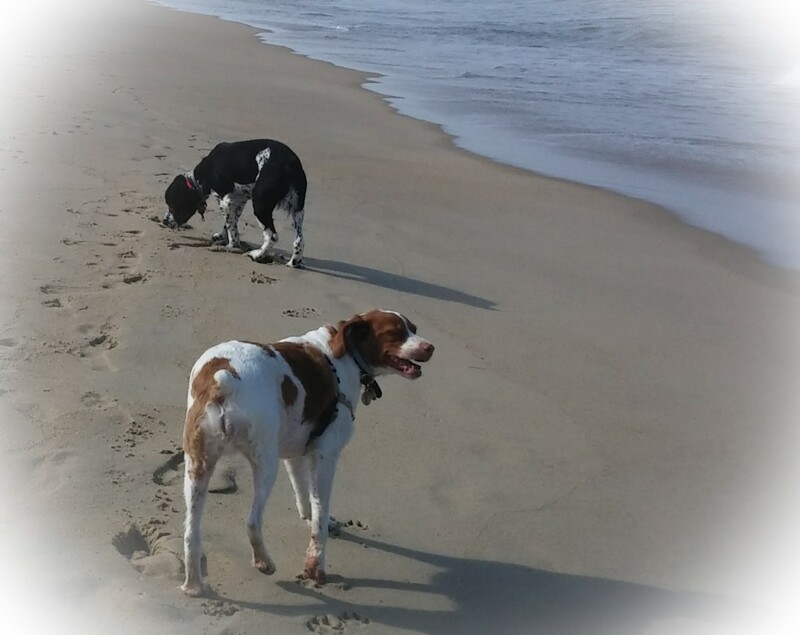 We belong to Pet Sitters International (PSI) and the National Association of Professional Pet Sitters (NAPPS). We joined these groups as a part of starting our business because we are dedicated to doing the job right and keeping your pets safe and happy while you are away. We knew we needed information from others who had done this work for a long time and that we needed to stay current with all things pets. 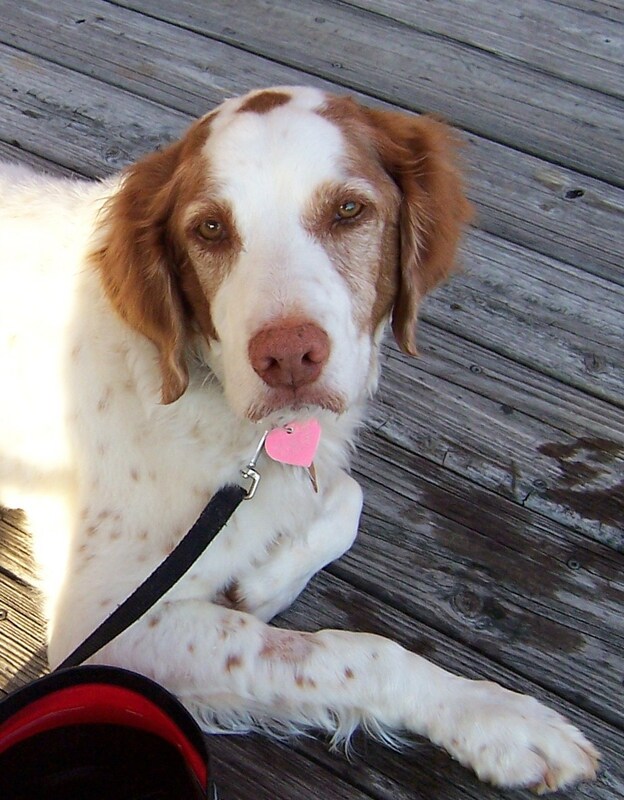 Both PSI and NAPPS suggest a variety of questions to ask a potential pet sitter. Key among those questions are: (1) does the pet sitter carry business liability insurance; (2) does the pet sitter use a services contract that discusses the services to be provided and the associated fees; (3) is the pet sitter trained in pet first aid and CPR; (4) how does the pet sitter keep the key to your home secure; (5) does the pet sitter have a clean criminal record history; (6) does the pet sitter participate in continuing education on line or at pet sitters’ conferences; (7) does the pet sitter meet with you and your pets in your home prior to beginning services and is there a fee for this meeting; (8) does the pet sitter have a website that you can review to get information about the people and the company; (9) how much time will the pet sitter spend in your home with your pet; (10) what will the pet sitter do if your pet becomes ill or is injured; and (11) how does the pet sitter communicate with you. We are happy to assure you that (1) we are insured and bonded by Business Insurers of the Carolinas; (2) we have a comprehensive services contract; (3) we are both trained in pet first aid and CPR and Billy is an instructor in the Pet Tech family of pet first aid and CPR courses; (4) we have passed a background check with Sterling International (5) the keys to our clients’ homes are coded by number only and maintained in a locking key cabinet when not in use; (6) we attended the PetSittingOlogy conference last October and will be attending the PSI conference in September; (7) we always conduct a free meet and greet with potential clients and their pets in their home prior to beginning services; (8) our website is www.coddlecreekpetservices.com; (9) our pet sitting visits are untimed…..we stay as long as necessary to attend to the physical needs of your pets, provide them with emotional comfort and reassurance, collect your mail and newspapers, rotate your lights and blinds, roll your garbage and recycle bins to and from the curb and water a few house plants; (10) if your pet becomes ill or injured while you are away we will assess the injury or symptoms, apply first aid, contact you for instructions and if not able to reach you will take your pet to the vet if our assessment of the injuries or symptoms indicate the need for veterinary intervention; and (11) we send an email or text message after every pet sitting visit. Please visit our website to learn more about our services. We love to look at special days, weeks and months for ideas about celebrations. And we are delighted to learn that February is Responsible Pet Owners’ Month. Really, every day should be responsible pet owners’ day and we are sharing the 11 qualities we believe demonstrate responsible pet ownership. Learn all you can about the dog or cat breed you are considering adopting. Make a commitment to your pet for life. Have your pet micro-chipped and affix current ID tags to your pets’ collars. Always make sure they are wearing their ID tags when they go outside of your home. Get your dog or cat spayed or neutered. Exercise your pet’s body and mind every day. Feed your pet the best quality food you can afford. Get regular veterinary care for your pet. Brush your pet’s teeth every day. Make adequate arrangements for your pets’ care when you go out of town. Learn pet first aid and CPR. Knowledge of the needs of the pet you want will help to assure a good match between the pet and your household. You need to know the most typical health conditions of the breed, how much exercise is required and if you are able to provide that type and frequency of exercise. For instance, you need to select a veterinarian that can provide care for the pet you want. If you are considering adopting a bird, is there an avian specialist veterinarian nearby? What are the nutritional needs of the pet you want? What type of training is needed? And remember, it is really you who needs the training!!! We strongly support pet adoption. According to the US Humane Society, approximately 2.7 million dogs and cats are euthanized every year. These are pets that were surrendered by owners, dumped, or found stray. If you adopt a pet, you save his or her life and make room in the shelter for another pet. If you buy a pet from an on line ad you are contributing to puppy mills. 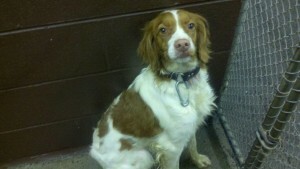 We adopted our Daisy Mae through National Brittany and Adoption Network (NBRAN). She helped our hearts to heal after Beau went over the Rainbow Bridge from lymphoma. Yes, adopting a pet can put a smile on your face. Don’t worry, her life jacket was in the boat!! Rita Reimers, noted cat analyst has written a heartfelt blog about people dumping their cats. Approximately 15% of pet owners report having lost a pet within a five year period of time according to a recent ASPCA study. ID tags and microchips were important in getting 15% of the lost dogs home. It’s important for ID tags to have the owners’ cell phone number as well as the number of another emergency contact. If there is enough room on the tag you can add the land line number and if comfortable with it the home address. Be sure to update the information if you move or get a new phone number. And, please register the microchip information with the microchip company….otherwise it is useless! Every year, millions of unwanted dogs and cats, including puppies and kittens, are euthanized. The good news is that responsible pet owners can make a difference. By having your dog or cat sterilized, you will do your part to prevent the birth of unwanted puppies and kittens. Spaying and neutering prevent unwanted litters and may reduce many of the behavioral problems associated with the mating instinct. A study done by the National Council on Pet Population Study and Policy (NCPPSP) and published on PetFinder’s website indicated that 96% of the dogs relinquished to shelters had received no training. There are some basics that are essential to a happy relationship between you and your dog. These include potty and crate training, and the cues for sit, stay, down, off, drop it, leave it and come. For fun you can always add in tricks such as roll over and high five! We heartily recommend positive reinforcement training. If you need a trainer locally we are pleased to recommend Donna Rogers with K-9 Capers Dog Training Academy in Concord and Sara Higgins with Positive Pups Dog Training, LLC in Cornelius. What about training for your cat or bird? Yes, you read right. Pets Web MD offers great tips for training your kitten or cat to use the litter box. The Partnership for Animal Welfare offers tips on teaching your cat to use a scratching post. Many years ago while still working as a social worker one of my clients told me he had trained his cat to walk on a leash. I was pretty astounded at the time, but have since learned it is a valuable skill. Mother Nature Network offers some tips on helping you and kitty acquire this skill. Pet MD offers tips for training your pet bird. Multiple issues are also common to other species: biting, screaming (barking), grooming, using treats, chewing on furniture and traveling. We got a laugh about talking birds and their sometimes unsavory vocabularies! All pets need physical and mental stimulation on a daily basis. You can play games indoors with your kitties to engage them and keep them on the move. Of course, we know that dogs need time for sniffing walks when they can check and deposit “pee mail.” A good generalization is that most dogs need at least 2 walks of 15 minutes duration every day. The specifics will depend on your dog’s breed, general health and temperament and age. If you don’t have time to walk with your dog on a regular basis, consider hiring a professional dog walker several days per week or even daily if your budget allows. Having a variety of places to walk with a variety of sights and smells will enrich your dog’s life. On those days that the weather makes long walks out of doors unsafe, play some mental games inside. Nose work inside is particularly effective. Remember not to overfeed your pets either. Pet obesity has become a huge problem in the US. It’s best to feed your pets at certain times of the day so you can easily assess how much they are eating. An added benefit is if they eat on a regular schedule they will be more likely to eliminate on a regular schedule. 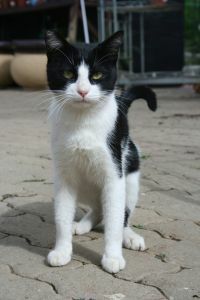 Leaving dry kibble down for cats is discouraged too because they benefit from eating canned food. Cats tend not to drink enough water so they need the hydration from canned or “wet” foods. Lisa A. Pierson, DVM offers an excellent explanation of these facts. In general pets need to be assessed by their veterinarian on at least a yearly basis. Puppies and kittens as well as senior pets need to be evaluated more frequently. And of course, pets with chronic medical conditions need more frequent monitoring. Regular checkups include examining the ears, eyes, nose, abdominal organs, skin and fur and heart and lungs. This is also the time for vaccination protocols, heartworm preventative medications and lab work. It is much easier on the pet to prevent a problem than to treat a problem. And we might add, less expensive. 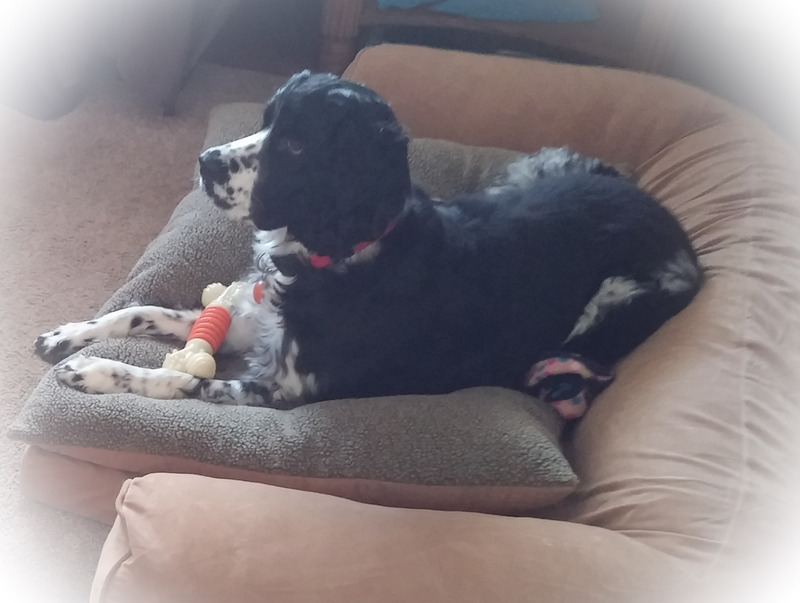 We fostered to adopt Trooper through English Springer Spaniel Rescue America (ESRA) and he came to us Heartworm positive. It was heartbreaking having to keep him quiet during the months of treatment. Yes, you can and should do this. It’s easier if you start when a puppy, but they can learn to accept it at any age. just be sure to use toothpaste made for dogs and cats, not the human kind. Human toothpaste has soap in it to make it sudsy and that’s not good for our pets because they can’t spit it out. Experiment until you find the flavor they like (vanilla, mint, chicken, beef). There are a variety of types of toothbrushes too, so keep at it until you find the right one. I brush our dogs’ teeth multiple times per week and we are going to be able to skip dental cleanings this year. That is not only a financial savings but we’re so relieved not to have anyone put under anesthesia. Just as with humans, there is a link between good oral health and good general health. Dogs with proper dental care live on average two years longer than those without proper dental care. Luke is almost 9 years old and is an old hand at getting his teeth brushed. Daisy Mae and Trooper are mildly resistant (we adopted them) but they are getting better at accepting it. In today’s world we have numerous options for pet care when we are unavailable. Options include friends or family members, in home pet boarding, pet kenneling and professional pet sitting in your home. We recommend against the use of the kid next door at any time. While family and friends may work out some of the time, it can become an awkward situation if you ask them too often. It’s important to avoid the “hobby sitters” who do this to pick up “pin money.” They are extremely unlikely to be bonded, to carry professional business liability insurance, to have a criminal background check, to be trained in pet first aid and CPR and to be available long term when the novelty of “playing” with dogs and cats has worn off. If the cost is an issue and you only have one pet you may be well served with a good boarding or kenneling facility. If you have two pets your costs between a professional pet sitter and a facility will be similar. If you have three or more pets or pets of multiple species you will most likely find a professional pet sitter who provides care in your home to be most cost effective. While many pets do well in a boarding facility, most thrive in their own familiar homes. A professional pet sitter will be able to give your home that lived in look with rotation of lights and draperies, mail and newspaper collection, roll out of garbage and recycle containers and watering a few houseplants. Two professional pet sitters organizations offer user friendly pet sitter locator services: Pet Sitters International (PSI) and National Association of Professional Pet Sitters (NAPPS). No one wants to encounter an emergency, but we all know urgent issues happen every day. It’s a good idea to take a class in pet first aid and CPR. There are numerous options available. Billy has been trained by two organizations. After we were both trained in the PetSaver program by Pet Tech last October we were both so impressed with the program that he took the training to become a trainer. He offers the courses approximately 8 times per year. Learn about PetTech at this link. See Billy’s instructor profile at this link. Thanks for taking the necessary steps toward responsible pet ownership!!! Have you ever wondered what the “More” is in our business name? When we were brainstorming what to name our business we purposely made allowances for expansion. Hence the “More” in our name. On February 28 you will see one of the multiple reasons for “More” when Billy begins offering pet first aid classes. Both of us were trained by Pet Tech, Inc. in pet first aid and CPR last October. Billy’s background with first aid and CPR with humans has easily transferred to pet first aid and CPR. In January Billy achieved a significant professional goal after attending a three day training course for Pet Tech Instructors. 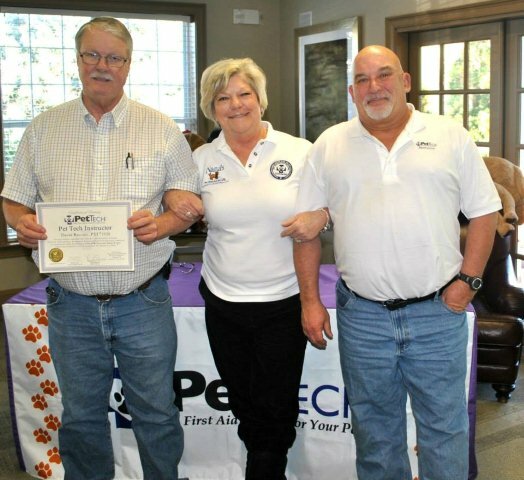 Pet Tech is an international organization whose mission is “Improving the quality of pets’ lives, one pet parent at a time.” Pet Tech is the premiere organization offering information and training in Pet CPR, First Aid & Pet Care. Check out the web site at http://www.pettech.net for full information. Billy successfully completed the Pet Tech Instructor Training program in January, 2015 and is qualified to teach the Pet Tech family of programs. The 8-hour PetSaver™ class includes the skills and information necessary to prepare the pet owner in the unfortunate event of a medical emergency involving their pet. Some of the topics highlighted in the class include: CPR, Rescue Breathing, Shock Management, Bleeding, Injury Assessment, Heat Injuries, Cold Injuries, dental care and senior care. These skills are essential for dog and cat groomers, dog walkers and pet sitters too. Billy now offers Pet Tech’s pet first aid and care classes for pet owners: PetSaver™, First Aid & Care For Your Pets™ and Knowing Your Pet’s Health™”. Why Take a Pet First Aid Course? 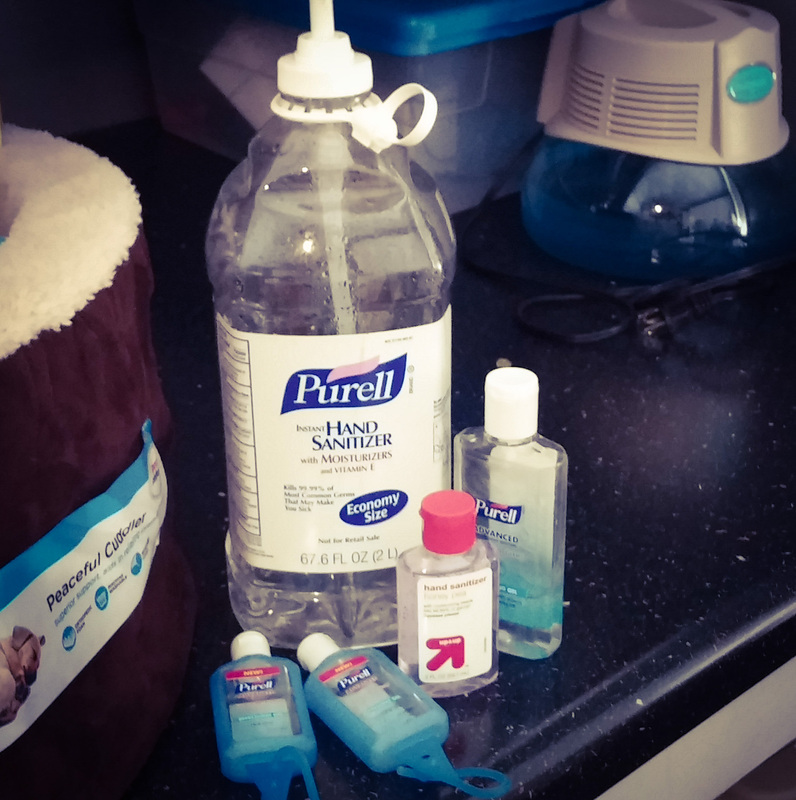 An important part of being a caring, conscientious, responsible and loving pet owner is knowing the life saving skills of pet first aid and care. Your pets, just like children are at greater risk of death or injury from preventable accidents than any other reason. Taking the correct and proper actions can significantly increase the chances of survival and reduce the extent of injury to your pet, before transporting them to your veterinarian. The PetSaver™ Class is designed to help pet parents keep their pets happy and healthy. Additionally, each student receives a copy of Pet Tech’s PetSaver™ handbook, an emergency muzzle and a certificate valid for two years. Your registration fee also includes lunch. Classes are scheduled for February 28, 2015 and March 21, 2015. For more information call Billy Harwell at Dog Walkers & More at Coddle Creek, LLC (704-662-0973). For those of you that have used our pet sitting, dog walking or pet taxi services, we offer a significant discount on the fee. You may call us to register. If you are new to our services you may sign up for the February 28 class here. You may sign up for the March 21 class here. For the first weekend in a very long time we did not have any pet sitting assignments so we enjoyed a stay-cation with our three fur babies. 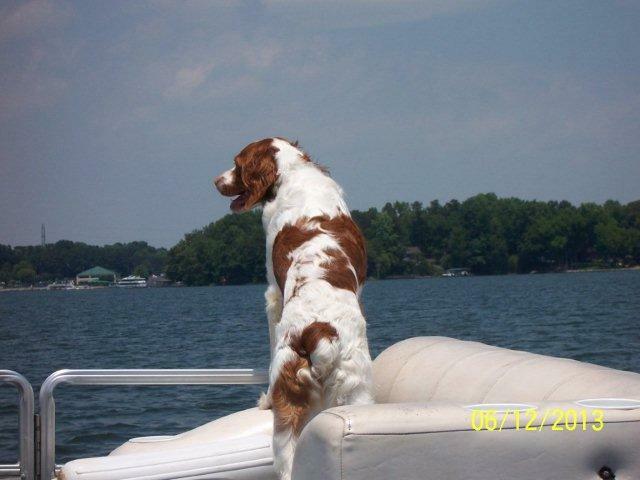 Living near Lake Norman is a blessing…and the weather this weekend was perfect. On Saturday Luke and I dropped in at the Open House at Main Street Veterinary Hospital in Cornelius. What a nice place that is. We saw lots of evidence of teddy bear surgery and teddy bear dental work. It was my first time in the surgical suite of a veterinary hospital and I was impressed. Luke is an old hand at dental cleanings so he did not flinch at all. After we left “surgery” we meandered down to Davidson and caught the tail end of Davidson Town Day. 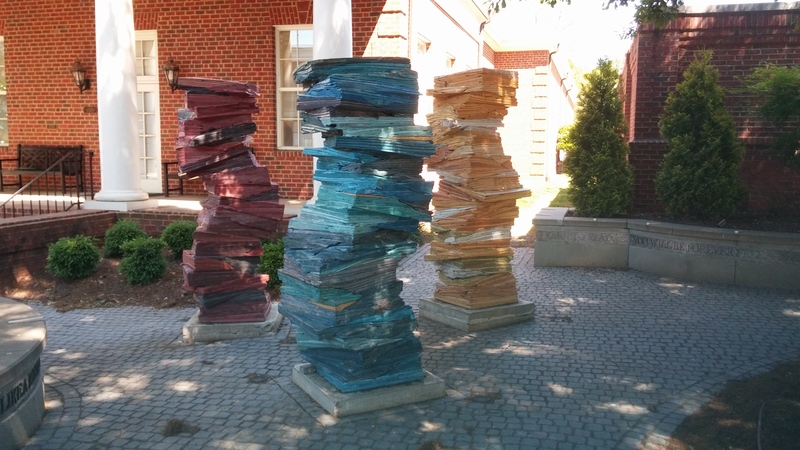 Luke took a few snapshots of the giant stacks of books outside the library. While Luke and I were out and about Trooper and Daisy Mae helped Daddy with yard work. 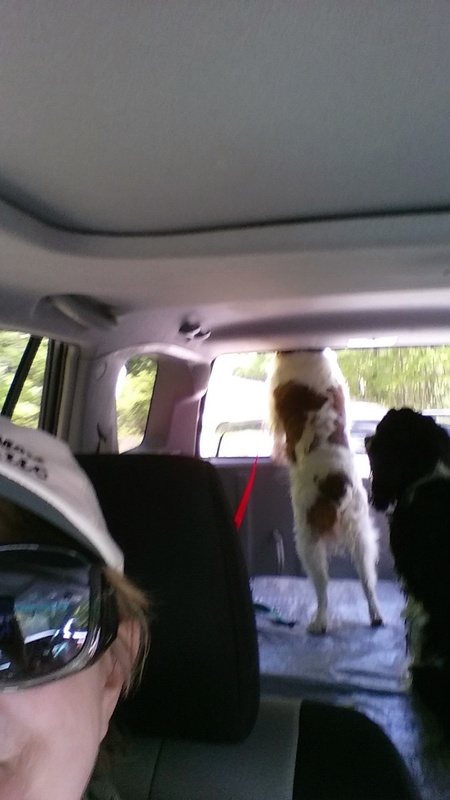 Sunday was another great day so the humans took Trooper and Daisy Mae to Lake Norman State Park for a hike. Luke stayed home to guard the homestead. We love the 3 mile trail along the lake shore but we were all worn out by the time we returned home. Hiking with these two is different from our hikes with Luke and our late Beau. Daisy Mae and Trooper were well behaved but clearly need a little more trail certification training! 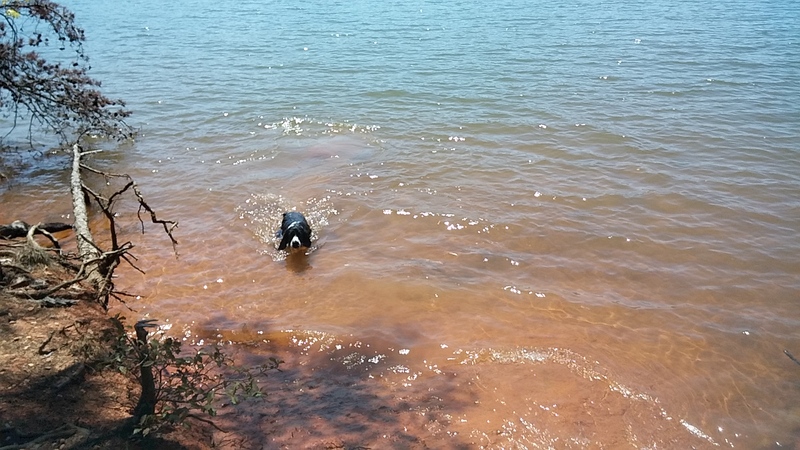 Trooper shows us he knows how to swim. All in all we enjoyed our stay-cation. Now we are ready to get back to pet sitting and dog walks on a little more even terrain (and shorter routes than 3 miles). Please provide any other information about your pets or your request you wish to share. 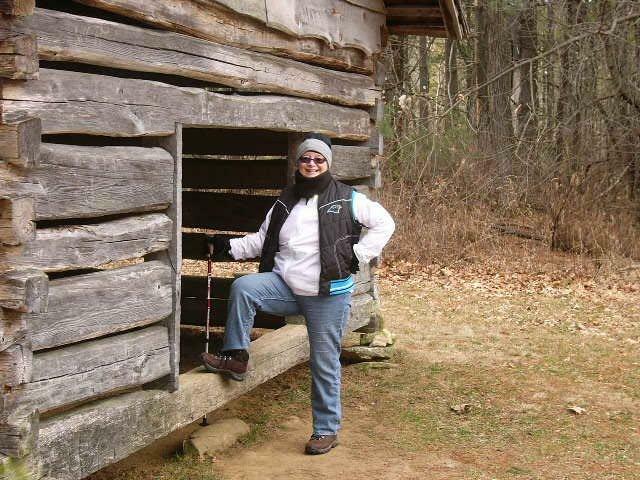 Beth Harwell on What Is a Professional Pet Sitter? Emma McGann on How Are You Celebrating National Dress Up Your Pet Day?